Dylan is a visionary. He dreams big and asks when and how, rather than thinking never. He has found light and happiness from a place of darkness and tears. His story brings hope and inspiration for others to reach for their dreams and to let nothing stop them from finding peace and comfort. For many years, the House of Kung Fu Asian Arts Center of Olympia has been teaching the many disciplines of martial arts to young men and women in the city of Olympia, Washington. Sifu Brinkman, 31 has had the satisfying experience of passing on his knowledge of Kung Fu to many students. A high percentage of young people who study martial arts become stronger and more confident. It's about self-control and channelling inner energy for better results in life. That alone can make the time and work invested by a Sifu worthwhile. But every once in awhile, an individual enters the class and creates a symbiotic relationship with the teacher, in which the Sifu profits emotionally as much as the student. Such a person is Dylan Kuehl. Dylan, now 24, joined the Kung Fu Asian Arts Center in the Spring of 2005. "When he first joined, it was through C.J, a friend of his," says Sifu Brinkman, "C.J and I are also friends and he had spent time with Dylan as a mentor and he introduced me to Dylan." Sifu's first impression of Dylan was a positive one. "He's really personable and motivated and inspired to move." says Sifu. "He's really very much a performer in many ways." Actually, Dylan had studied some martial arts before he began working with Sifu Brinkman. "I took Ju-jitsu for 6 years," says Dylan, his pleasant nature spilling out with every word, "I had a good reason for taking ju-jitsu -my brother knew the sensei -my brother's name is Birch." Dylan then spent 1 � years learning Capoeria Angola, an African-Brazilian art form. "It's a mixture of acrobatics and rhythmic dance involving martial arts," explains Dylan. Now Kung Fu is his martial art of choice. "I feel that Kung Fu training is more traditional than other Martial Arts," he explains, "because of the Chinese Culture." Kung Fu is just one of several endeavours that Dylan takes part in. He's also a skilled artist whose visual art and poetry works can be viewed on his website at www.dylankarts.com. In addition, Dylan is a hip-hop, tap and modern dance performer and also works out a lot of personal frustrations on his drum set. It was easy for Sifu Brinkman to identify that Dylan Kuehl was a man with a creative and inventive spirit. "He's very good," observes Sifu. "He likes to improvise his own movement and routines so I give him free reign to do that. He does a number of performances. He's very focused and very gentle. We're dealing with combative movements and there are a great number of people who come in and have a hard time controlling themselves physically. There is a tendency to move a little too fast or hit a little too hard, but that's not an issue with Dylan. If anything Dylan is very cautious and gentle with the other people he works with." Brinkman was not certain about the kind of relationship he might have with Dylan or even the type of student Dylan might be. Before they first met, Sifu Brinkman was told that Dylan had Down syndrome. "To be honest, I wasn't very familiar with Down syndrome," admits Sifu, "Dylan has the visual characteristics but he functions at a high level." Down syndrome is considered a genetic disorder. It occurs at a rate of about one out of every 800 births in the United States. 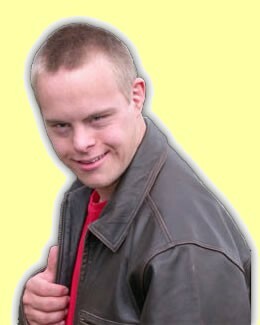 It is only in recent years that the term 'mental retardation' has diminished in its descriptive use of the person with Down syndrome. Retardation means a slowing down effect. And there's nothing slow about Dylan Kuehl. If anything, he is rising in his Kung Fu skills at a rate faster than typical students. "We have three levels," says Brinkman, "And it can be years and years of study. Dylan is just about ready to go into the second level. That's very good progress not to mention he has so many other endeavours that sometimes he is not able to be at class." Dylan says that his Kung Fu training is instrumental in the success he has in other endeavours. "It does help me to get my strength for entering myself into the Special Olympics power-lifting," he tells us. His trophy chest has many Olympic gold medals in Special Olympic basketball, soccer, bowling and including four new gold medals in power-lifting from the last Olympiad. The movement of Kung Fu is also something that Dylan reports inspires him when he lets loose with the hip-hop dancing. "I just love dance. Dance is me and I am the dance," he says eliminating any doubt on the subject, "It's the person who does the dancing not the dance itself. I think kung fu is the same way." If we've painted a picture of serenity and blissful enjoyment so far, it's important to point out, that in fact, Dylan Kuehl's life has not necessarily been a completely happy or unimpeded one. Brinkman became more aware of Dylan's dark side after watching an unusual improvised exercise. "He had a performance recently," relates Sifu Brinkman, "Where he was acting out a martial arts routine in front of about 60 people. It was a performance that he had improvised and it was evident to me that he was really feeling the moment and making it up as he went along. It looked wonderful." But soon the performance took a turn that was both spellbinding and intense. "Towards the end of his performance it became obvious to the audience that he was expressing anger through his movements, "says Sifu, "This isn't something we encourage. It's really the wrong route to go as far as we are concerned. At the very end of his performance, he collapsed on the floor on his belly while holding his head. He was overwhelmed with emotion." A few days later, Dylan approached Brinkman to explain the unusual performance. That was when the Sifu learned more about his student's inner turmoil. "He said that he wanted to talk about anger," says Sifu Brinkman, "That he was feeling anger during his demonstration and he mentioned that he had been physically abused as a child. He said that when he was ten, a door had been slammed on him and it had broken his arm. To my mind it seemed that he had made the connection and found a way of transcending this mire of feeling bad about the past and he was able to express it. However unsettling it might have seemed to the audience, he really was dealing with it." Dylan is surprisingly frank and introspective about his feelings and especially about that particular occurrence. "Well for one thing, I just couldn't control my anger," he reflects, "I did have feelings of worry and concerns. My head was full of questions. I felt a whole lot better after we talked. I was frustrated with my feelings of anger -the rush of anger". "Between the ages of five and ten, Dylan endured difficult times," says Terri Rose, his mother. When Dylan was just eleven, he was quite strong for his age and began hitting others, me included." She recognized that his anger was manifesting itself in hostile behaviour and he needed help. "Instead of sending him away to a residential school that helps individuals with behavioural challenges, I got him a drum set along with an art and movement instructor. This was all brought into his life as therapy to help him manage his built up energy and anger." What once began as therapy has been transformed into his daily life and well-being. He dances everyday, practices martial arts at least three times per week and continues to create beautiful art and poetry for his own visual and performing arts company, DK Arts. Dylan's Kung Fu experience seems all the more positive thanks to the support and encouragement he has received from Sifu Brinkman. "By helping me how to control my anger, he gives me advice and helps me control my anger," says Dylan gratefully and then his face lights up, "One day he taught me a technique when my stomach hurt. He taught me to lie down and rub my belly clockwise to make the pain go away. Sometimes this helps me to calm down too." Perhaps more than the people around him, Dylan Kuehl is keenly aware of the turmoil inside himself. On his website, there is a drawing entitled "Sunset" and the accompanying poem is revealing. Although Sifu Brinkman is now more aware of Dylan's ability to funnel his anger, the Sifu assures us that Dylan has never acted inappropriately in his class. "Periodically, I think, he'll become frustrated, "says Brinkman, "I see him as very much a person who is willing to struggle and grapple with that. He's never had an anger fit. He might express it other ways. When he becomes frustrated, he might be silent for a minute or go off by himself." "Dylan is quite an eye-opener about the world of the disabled," says Sifu Brinkman, "I guess before he started, I thought there's going to be all these adjustments I'm going to have to make because he has Down syndrome. Truth is, there were really no adjustments, no allowances. I forget that he has Down syndrome, I don't see any problems with his disability." Sifu Brinkman sees how the Kung Fu in Dylan's life weaves its way in and out of all his other passions. "I think his artwork is great," enthuses Brinkman, "There are some pieces that just blow me away. I'm impressed with all of the things he does." Dylan writes: "I am able to express myself with art. I get focused and detailed. When I do my art I feel emotional and passionate and dedicated. My art builds confidence and it builds character. Down syndrome doesn't limit my artwork, I just show my expressions of being that unique." Through his actions alone, Dylan Kuehl has a substantial message for the world. It's about ability, not disability. It's about forgetting labels and pursuing opportunities. But, because he also expresses himself so brightly and emotionally, he has a verbal point worth examining as much as his eye-catching art. "To adults who have a young one, a child. Just tell them having disabilities is not an obstacle. Tell them, don't be afraid to show your abilities and show it to the community -it's what you are."